Concocting “z” Solution	Pass the brains…I mean gravy. Zombie Invasion Day 6: We found out that the cure to a zombie virus caused by McDonald’s Hamburgers was gourmet food. 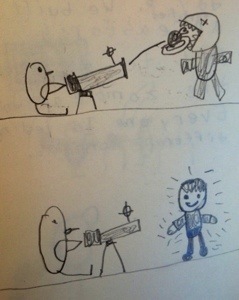 We used our cannon to cure the zombies.